Many business leaders in Britain, and many economists, fear the tumult that may emerge from the “Brexit,” the county’s historic decision to abandon the European Union. But in one slice of the country’s education market, entrepreneurs and investors are searching for strategies to withstand—and perhaps even embrace—the period of vast uncertainty enveloping the private sector. During a discussion held this week at the Bett conference, founders and supporters of British ed-tech companies here said that startups can succeed and even thrive amid prevailing Brexit fears. The best of those startups, they said, are nimble and aggressive, and had been inclined to explore markets beyond the U.K. before the pressures of Brexit took hold. “They’re not going to wait for things to happen—they’re going to make it happen,” said Justin Smith, the co-founder of the EdTech Exchange, which describes itself as Europe’s largest community of founders of ed-tech companies, and provides those businesses with mentoring and support. Smith, who also is the founder and CEO of the Educational App Store, said Brexit is likely to reinforce British companies’ interest in chasing opportunities in established and developing markets outside the U.K., if they’re not doing so already. He sees ripe conditions for sales in nations like Pakistan and India, as well as smaller markets such as Rwanda and Malta and many others. Many of those countries are made more attractive because they have centralized buyers in governments occupied by ministers of education who are keen on ed-tech. Smith’s observations came during a panel titled “Brexit, Six Months Later: Effects on the International Startup Scene,” led by Patrick Hayes, the director of the British Educational Suppliers Association. A narrow majority of voters in the U.K. decided in a referendum last year to abandon the EU, a move that stunned political observers and sent a shock through financial markets. But as the Bett conference played out last week, major questions about how that divorce will occur were still being hashed out by top government officials across London, and in the halls of British government. 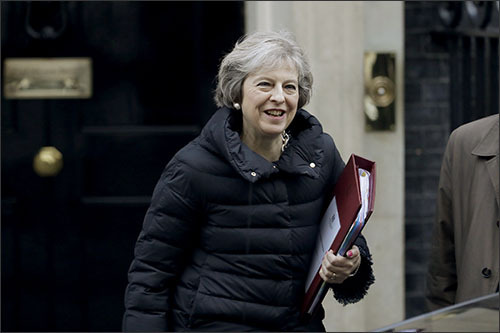 British Prime Minister Theresa May, who initially opposed Brexit, has vowed she will uphold the will of the voters and see it through. Yet this week, the U.K. Supreme Court ruled that May must give the British Parliament a say in approving her Brexit plans, which will presumably give lawmakers who oppose her blueprint a chance to weigh in on the withdraw. One of the other speakers on the panel, George Burgess, the other founder of EdTech Exchange, said that many British ed-tech startups are already aware that the lifeblood of their business lies outside of Britain’s education system. Other, overriding economic changes wrought by the Brexit are helping some British ed-tech startups, Burgess said. The British pound has taken a beating since the decision, yet the decline has made some British education companies more attractive to foreign investors, and not just from the United States. The British education system is an attractive brand for investors, particularly from Asia. “The Chinese, for sure, are deploying capital here,” Burgess observed. Those infusions of investment have given some young companies money to enhance their products and look for international sales, Burgess added in an interview after the session. Many questions remain that could affect Britain’s education sector, such as the long-term value of the pound, whether exporting companies will be hurt or helped by new trade agreements, and the impact on the country’s economic growth and public budgets. Photo: British Prime Minister Theresa May leaves 10 Downing Street in London earlier this month. By Matt Dunham/AP.